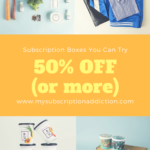 COUPON: Use code WELCOME10 to save $10 off your first box! Wigglebutt Box sends a seasonal kerchief every month. This box arrived far enough in advance of July 4 to be used then, which is nice. This was plenty big enough to fit around Nyx’s big Rottweiler neck, too. These are made in British Columbia, Canada and are grain free. They also have blueberries and cranberries, which may help with urinary tract health. Unlike a lot of other dog treats, they don’t contain any chicken-based ingredients, so if your dog is sensitive to chicken (it is a somewhat common pet allergen), these would still be acceptable. You’ll get a roll of these pretty much every month. This is about 3 days’ worth for Nyx (she is on a high fiber supplement) but I’m happy with the quality of the bags. I have actually bought more of these several times after discovering them here. This looks like something Nyx will be able to have. I introduce new foods slowly because of her IBD and she had just had a new treat last week, so I am holding off for now. But rabbit usually counts as a “novel” protein for dogs with dietary issues, so I am excited to have this! This is a plush, although Nyx did not even manage to put a hole in it during the few minutes she had it. I would watch a larger dog playing with this. Nyx kept trying to put the whole thing in her mouth and she very nearly succeeded. For what it’s worth, it seems fairly sturdy and well-made. Posing for the camera. I can’t believe she actually sat still! This toy didn’t photograph with a black dog well, but Nyx enjoyed it anyway. Verdict: I calculated a value of $32.78 for this month’s Wigglebutt Box. That is pretty close to the cost of the box and is a little bit low for Wigglebutt Box. But, if you use the WELCOME10 coupon or longer-term subscription, you could save a bit and make this box a better value. Nyx did quite enjoy the toys and will be having one of the treats later in the week, so she is happy. What do you think of the June 2017 Wigglebutt Box dog subscription box? Do you subscribe to any dog or cat boxes? NGL, I always click on the dog box reviews just for pictures of the pets! Also, I notice almost all of these boxes contain toys. My dog is an older dog who never plays with the toys I purchase him. Anyone happen to know of a dog box that only contains treats? I don’t, but only because Nyx is the opposite — she’ll play with any toy but can’t have most of the treats. Rabbit and green pea dry food was great for one of my passed cats who had IBD.